Heat Rash or Miliaria is characterized by tiny red or white raised dots or lumps on the skin which can be very itching and irritable. Although it is commonly seen in babies, it can affect children and adults too. It is also called “Prickly heat”, as the name suggests the patient gets a warm and prickly feeling over the rash. It is common in warm and humid weather conditions, such as during summer months. 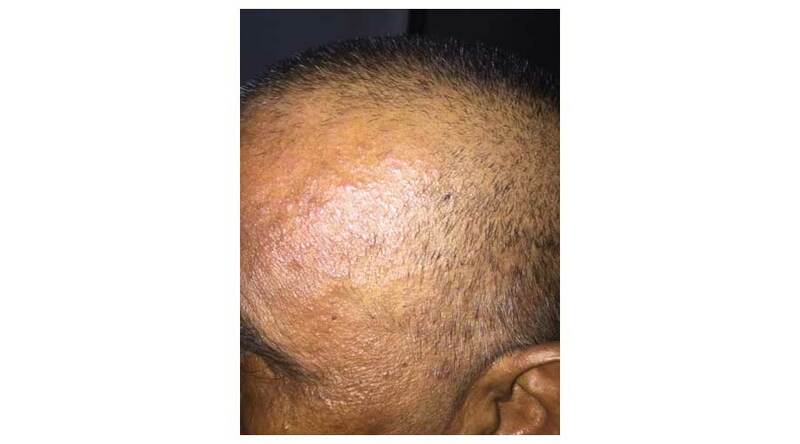 Heat rash is commonly seen in people in tropical countries. Heat rash when left alone will go off with time, especially once the weather conditions are reversed. 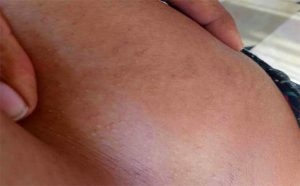 What causes the heat rash? There are sweat glands in the skin which sweat is produced. Perspiration comes out to the skin surface through pores or sweat ducts. These pores can get blocked sometimes, leading sweat to be settled inside or trapped under the skin. What are the Symptoms of the Heat rash? The symptoms of Heat rash can vary from tiny raised red or white dots which are superficial to tiny blisters or red lumps which can go deep. Itching can vary from person to person. Although commonly mild, few people can get severe itching in the area of the rash. Heat rash is mainly seen over the chest, neck, and shoulders in babies. In children and adults mainly neck, chest, and back get involved. It can commonly involve places where you sweat more or in skin folds where clothing leads to friction such as elbow creases, armpits, and even groin. How do you classify Heat rash? There are several types of Heat rash divided according to severity and how the rash looks. This form of heat rash is very mild. Sweat ducts are blocked from above, closer to the skin surface. There are tiny fluid-filled blisters and bumps. The fluid inside is clear. Itching can occur but not so intense. The rash is mild and when scratched these blisters can break. “Rubra” as the name suggests, the rash is red. The reaction occurs deeper in the ducts. Itching and the prickly feeling is more when compared to the previous form. The small blisters get infected and become pustular or filled with pus. The area becomes inflamed and red. The rash looks more severe. This form of heat rash is severe. 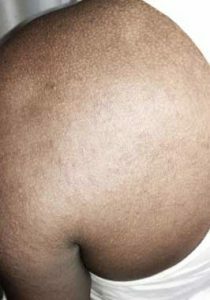 The involvement of the rash is deep within the skin. It is not a common type. As the perspiration which was blocked inside leaks out to the skin, flesh-colored firm bumps are formed in the skin and looks worse and more severe than all the 3 types mentioned above. Usually, a mild form of sweat rash does not need any treatment. Once the reason for the rash has eliminated the rash will settle on its own. Avoid heat exposure – There are certain occupations like firefighters, factory workers, lab workers, out-door workers who spend a lot of time in hot humid conditions. These people will have to cool off their bodies as much as possible during non-working hours. If heat rash is spread throughout, use soft cotton, loose clothes to avoid friction with skin. If the rash is associated with inflammation and redness can try 1% Hydrocortisone cream, which is a mild steroid and is available over the counter. If itching is difficult to bear can try an oral antihistamine like chlorpheniramine 4mg, Loritidine 10mg, Fexofenidine 180mg or cetirizine 10mg. Be cautious about the dose and frequency of administration. When buying an OTC product always check for expiry date and instruction leaflet. How do you know whether your Heat rash is infected? If the Heat rash is severe and infected you may need a prescription for a course of antibiotics from a qualified medical practitioner. When the heat rash is severe usually steroid creams are prescribed to be used once or twice a day for some time depending on response. Although Heat rash can be completely cured it can always recur due to warm humid weather conditions and increased sweating. How do you prevent getting Heat Rash?